Monon Process Started in the Late 1970's. Now in business for over 30 years we have accumulated a vast inventory of Process and Packaging Equipment. 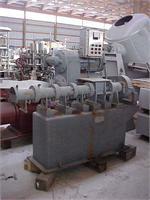 We buy and sell quality used process and packaging machinery for the Food, Pharmecutical and Chemical Industries. Now we have around 30,000 SQ FT of indoor warehouse and our outdoor storage lot covers around 10 acres. Feel free to browse our inventory or contact us directly with your equipment needs.